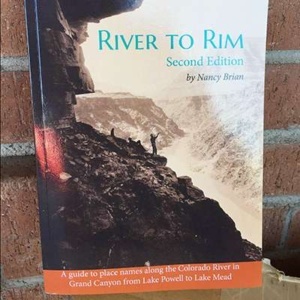 Nancy Brian, a former Grand Canyon river guide, NPS biologist, and just all-around awesome lady, recently updated her phenomenal book, River to Rim. The second edition contains even more fascinating details about all the incredible places you’ll encounter in Grand Canyon, from Lake Powell to Lake Mead. The book is a straightforward guide — an index of places and names and their origins and meanings — but the beauty of it lies in the well-researched stories Brian tells. Her love of the canyon and its river is apparent; her intrigue with Grand Canyon began back in the 1970s and it’s obvious, in River to Rim, her insatiable curiosity about Grand Canyon lore still runs strong. If you journeyed downstream with us and our guides’ stories about rapids and early river runners and Ancestral Puebloans sparked your own curiosity, River to Rim is the perfect in-depth followup to your river trip. You’ll love learning even more about John Hance, John Wesley Powell, Glen and Bessie Hyde, and Georgie Clark. And if you haven’t yet rafted Grand Canyon, this book will prepare you for your adventure like no other! You can pick up a copy of the second edition of River to Rim in our online store.